Old Soul: A Revolution-Era Hudson Valley Home Gets an Update from Jersey Ice Cream Co. 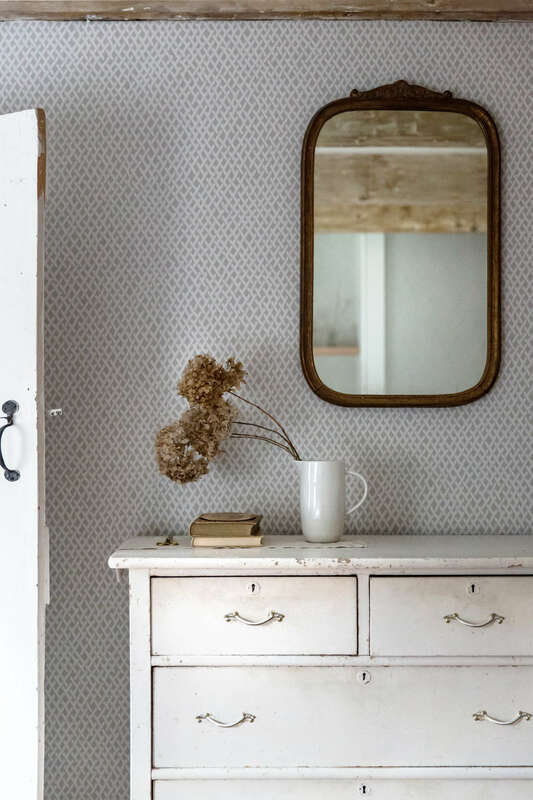 Seems to me, if you want a home with personality and character, you can do one of two things: spend a decade or more sifting through thrift stores and flea markets for storied finds that will endure the test of time. Or you can hire Tara Mangioni and Percy Bright of Jersey Ice Cream Co, the full-service design known for their unique approach in which they literally move into a space to get a better feel for it. The duo’s latest project: a revolutionary-ear home in the Hudson Valley. 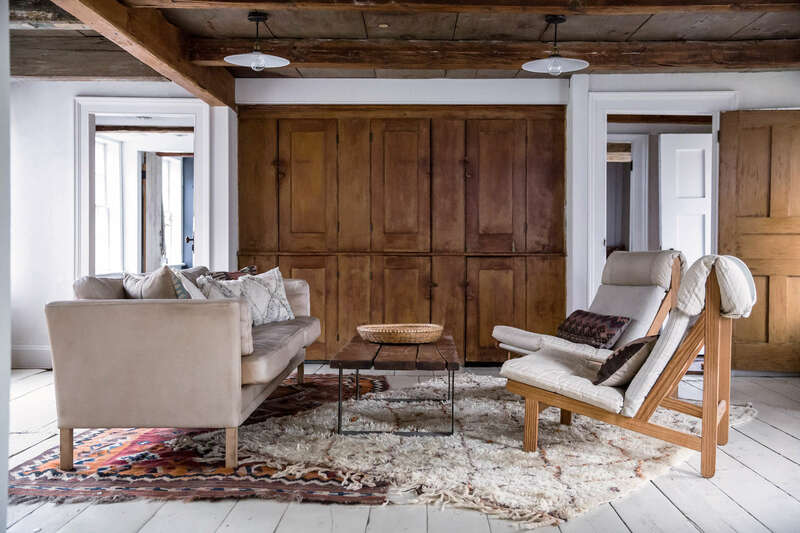 Tara and Percy’s clients, a Brooklyn-based young couple looking to relocate to the Hudson Valley, were actually renting this historic property in Old Chatham while they looked for a home of their own. Replete, as it was, with historic detail, the couple quickly realized they’d already found exactly what they were looking for. Luckily the owners were willing to sell. 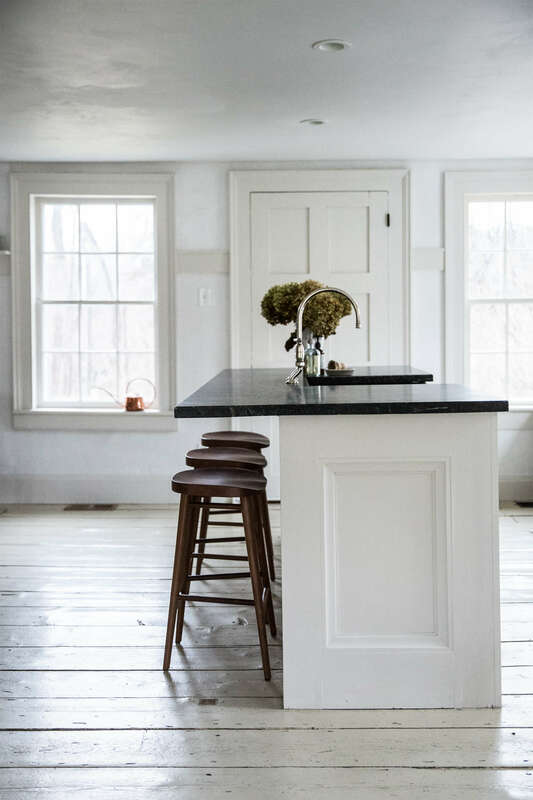 Unlike many of Jersey Ice Cream’s projects, this Hudson Valley home came with a lot of charm, including wide planked floors, exposed beams, and many original built-in cabinets. For Percy and Tara, the mission was to bring a more cohesive look to the space and to modernize it, without loosing any of the historic character. Above: Minimal intervention on the existing kitchen island included nixing the legs that hung awkwardly off the overhanging countertop, plastering the walls, refreshing the trim paint, and a row of Bay Counter Bar Stools from Room & Board. Above: Ripping out a “hideous” black tile backsplash, Percy and Tara added additional character and kitchen storage with bead boarding, Shaker pegs, and shelving. 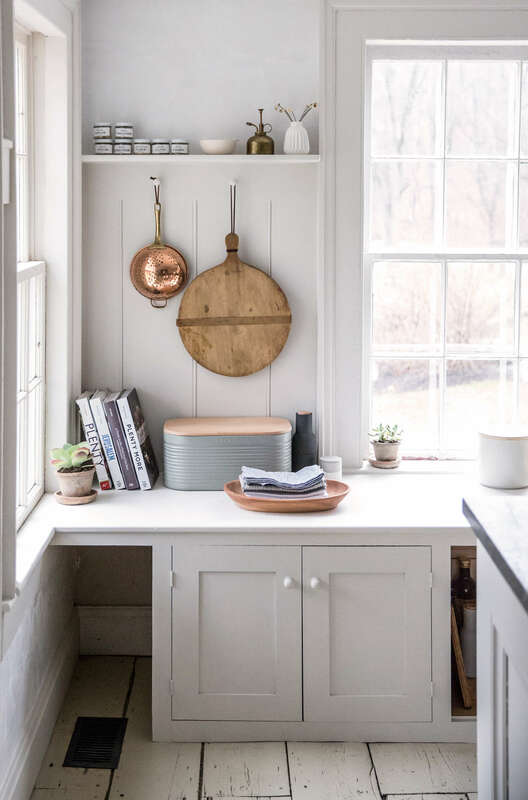 To create a more cohesive look, they also extended the counters to the wall and adjusted the height so that they aligned with the window sills. 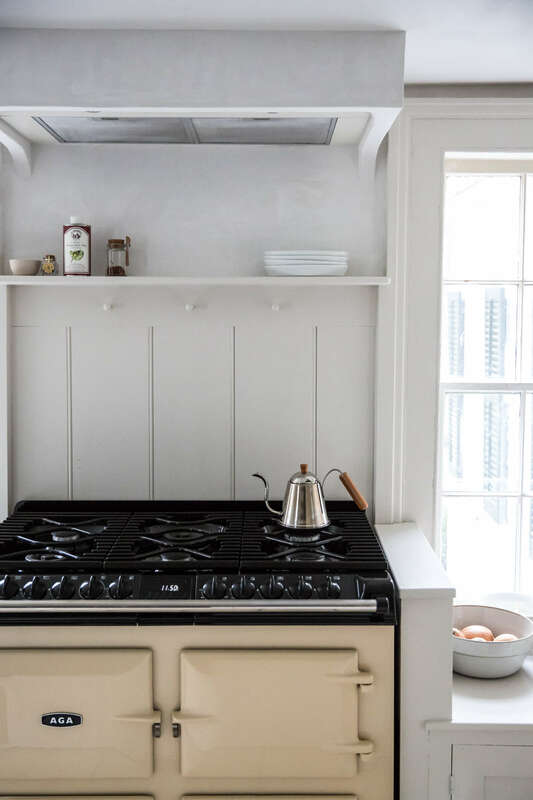 Above: Percy custom designed and built the housing for the vent hood over the cream-colored AGA stove. The walls in the whole kitchen received Percy’s favored plaster coating; the trim is Olympic Mountains by Benjamin Moore. 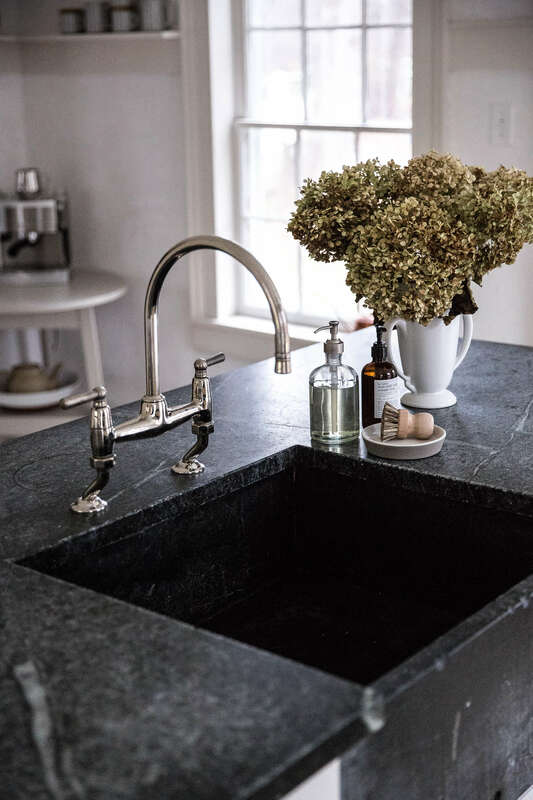 Above: To complement the soapstone sink, Tara chose a vintage-style bridge faucet by Barber Wilson. 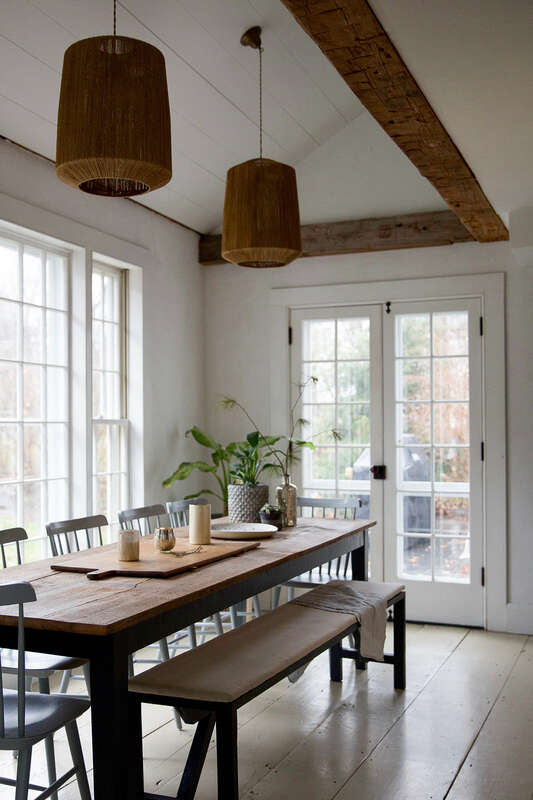 Above: In the lofty dining room, a long table designed and built by Percy himself sits under two Bungalow Pendant Lights from Anthropologie ($198 each). 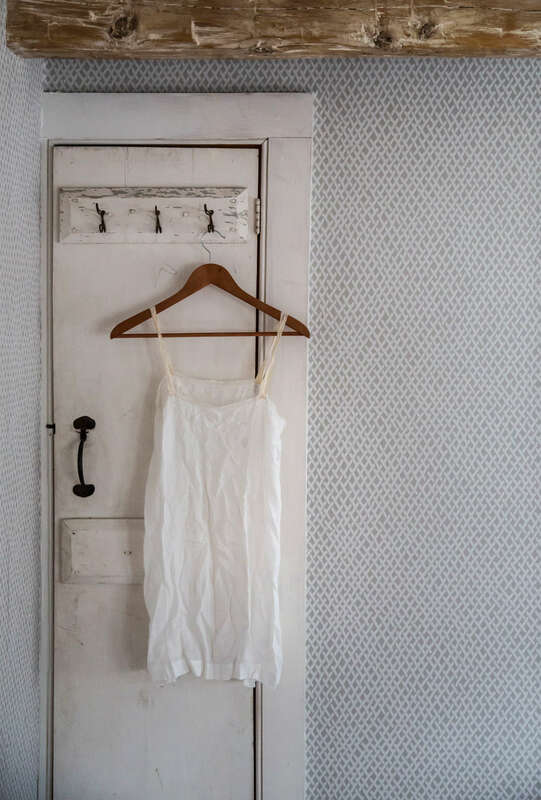 Downstairs, the wide-plank floors were already painted a uniform soft cream color, which Tara and Percy chose to keep. 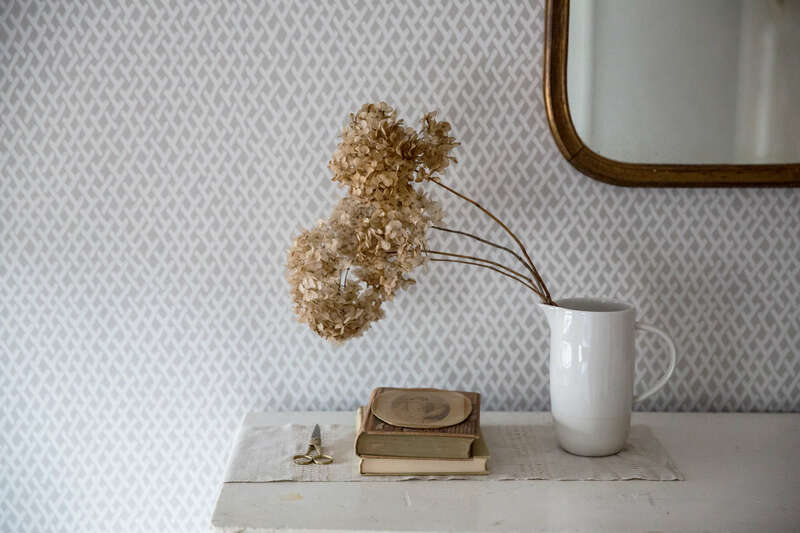 For an even more unified look, Percy applied his signature, textured plaster to the walls throughout the downstairs, including the dining room. 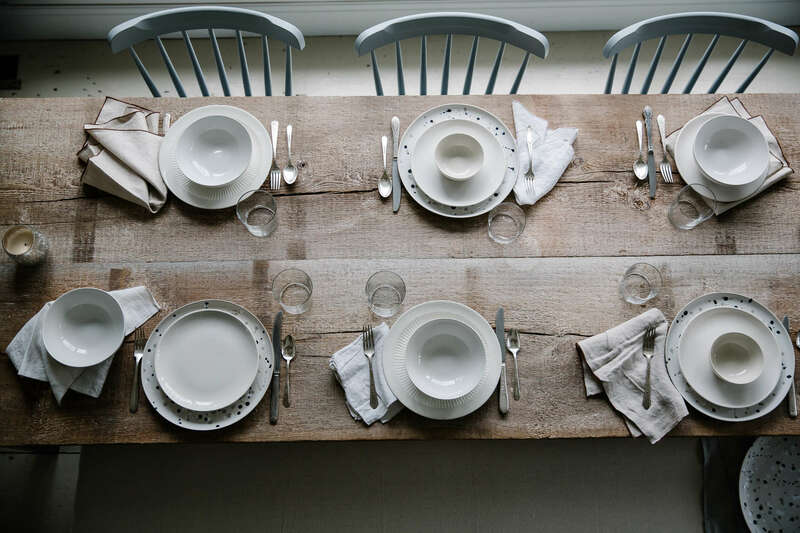 Above: The dining table, set for lunch. The chairs are DWR Salt Chairs in gray; $129 each. 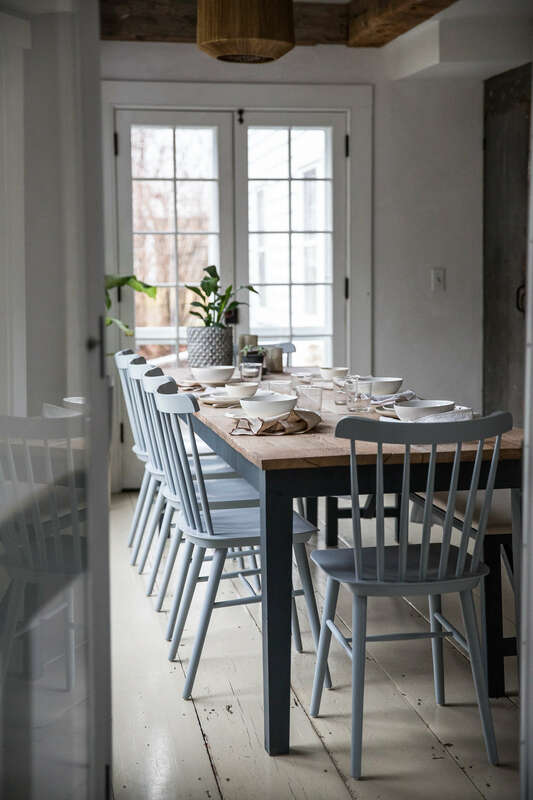 Above: A table setting features splattered Jackson Dinnerware plates from Remodelista NY Market vendor Hawkins New York; $34 each. 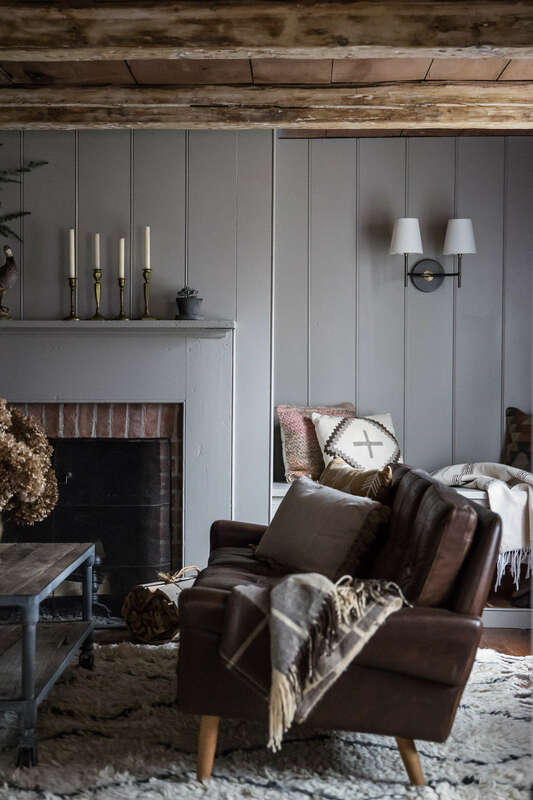 Above: A lounging spot around the fireplace includes a vintage leather sofa from Eneby Home, as well as a rug and Double Sconce Light from West Elm; $129. To create more visual interest, the couple added bead board walls in the family room. These not only complement the lines of the beamed ceiling, they also create the sense of more height. Keeping the feel fresh, but still inviting, Tara chose Perfect Taupe by Behr for the wall color. They also added the built-in seating area and storage on either side of the fireplace. 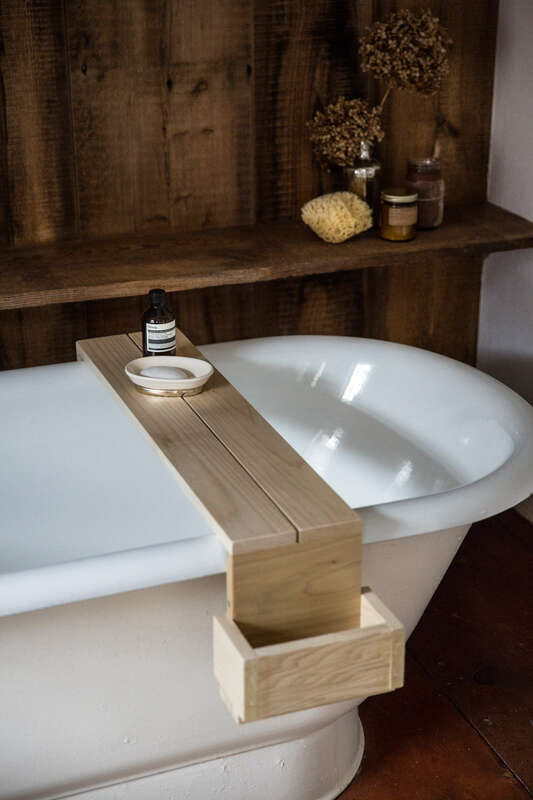 Above: In the downstairs bath, Percy built the sink from poured concrete and reclaimed wood. 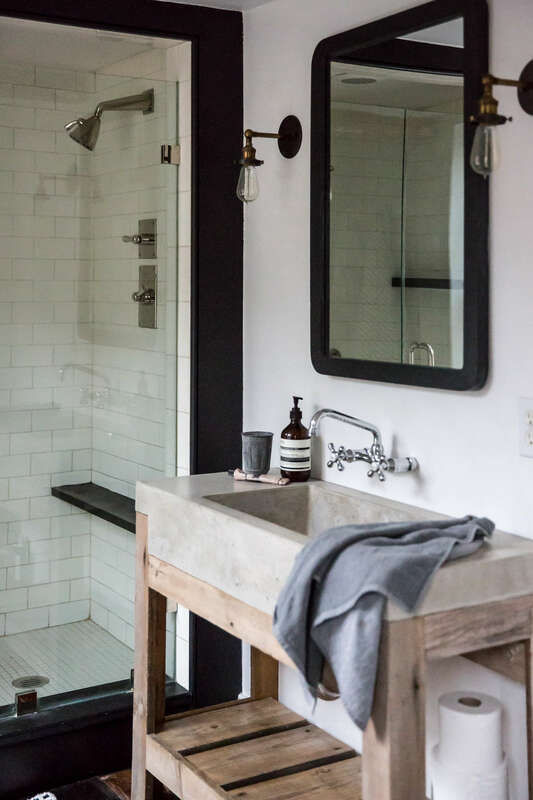 Tara added a vintage mirror, painted black to match the trim around the shower, flanked by sconces from School House Electric. 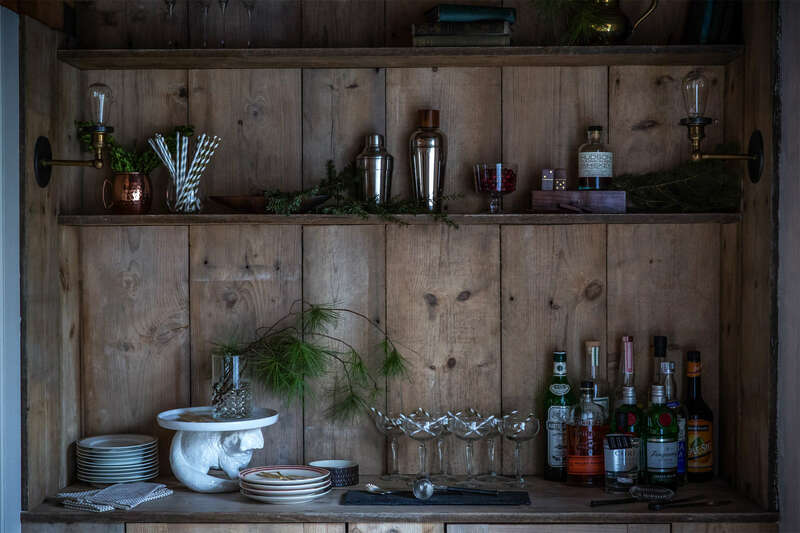 Above: Using reclaimed wood, Percy transformed a closet with an awkward pull-out desk into a rustic bar. Above: Vintage furnishings sourced from the Brimfield flea market complement the historic character of the living room. 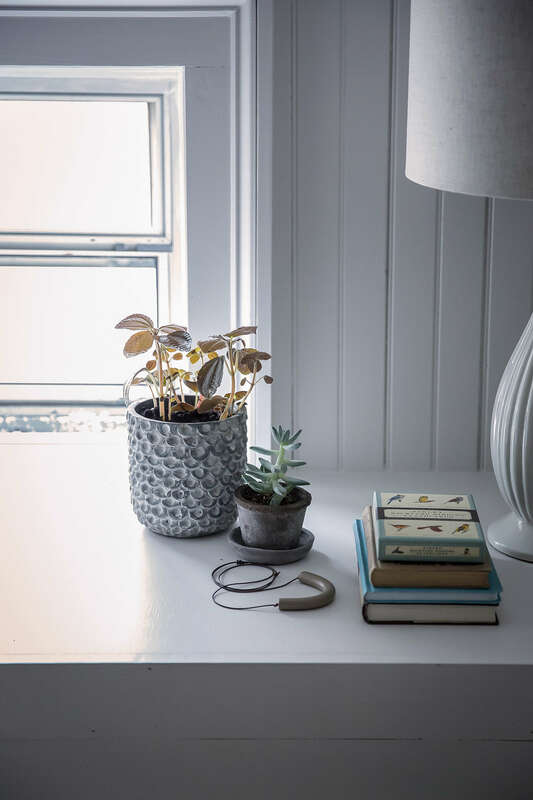 Only the milk-glass pendant lights are new: from Restoration Hardware. Above: Chock-full of original details, including the exposed beams and these hand-planed cabinets, the living room needed little more than furniture, a fresh coat of trim paint, and Percy’s plastering on the walls. 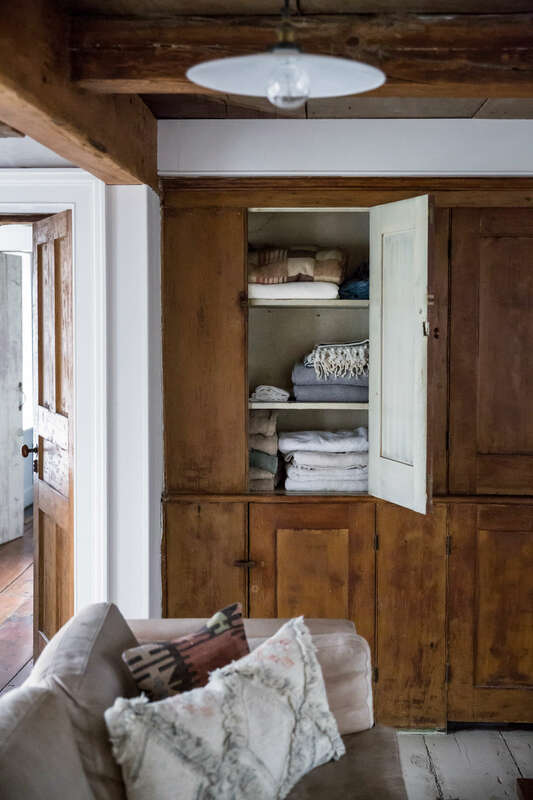 Above: To create much-needed storage without eating into the room, Percy built a restful nook using repurposed vintage doors and drawers. 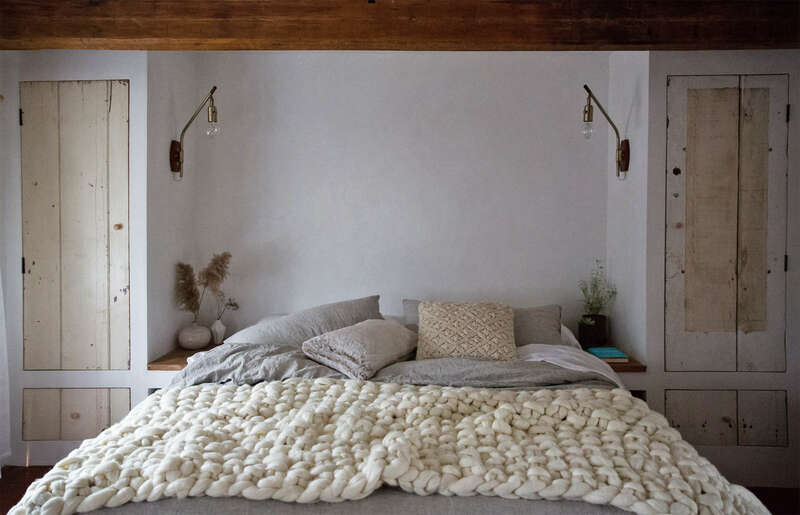 Plaster walls and Broadwick Fiber’s Chunky Knit Wool Blanket complete the cloud-like feel. Above: A detail of the bed nook, complete with a niche for books. 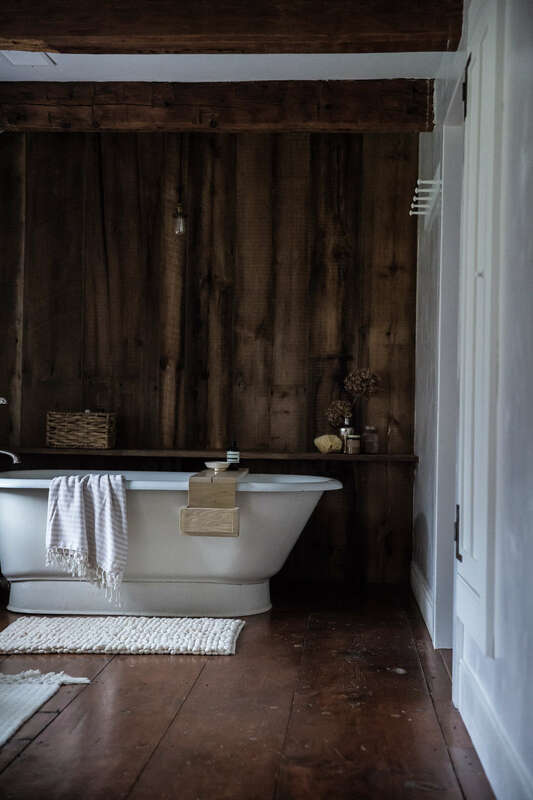 Above: The upstairs bath benefitted from existing dark, wide-plank floors and a vintage tub. To emphasize these even more, Percy created an accent wall of rough panelling. Tara applied the finishing touches such as the Turkish towel and bath mat from Home Goods. Above: A custom tub caddy, made by Percy. 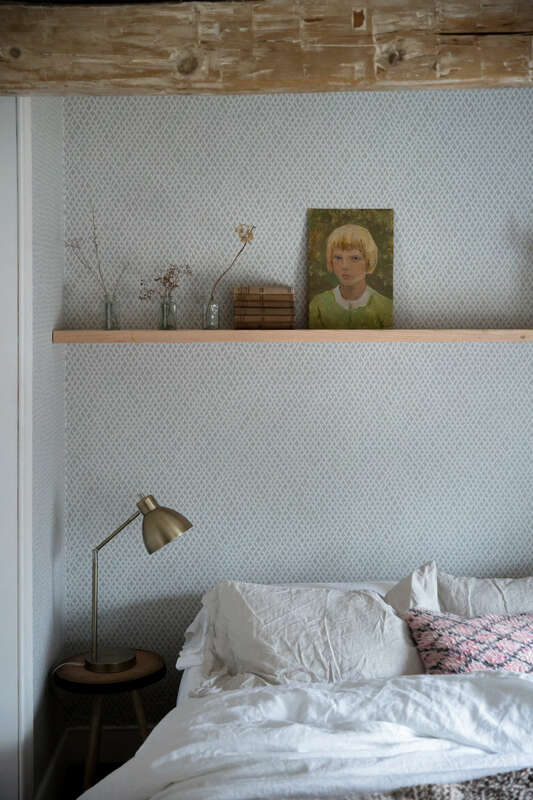 Above: In the guest bedroom, Tara demonstrated her genius for mixing new and old, as well as high and low, pairing Farrow & Ball’s Beautifully Woven Wallpaper ($250/yard) and West Elm Bedding, vintage accents and art, and a lamp from Target. 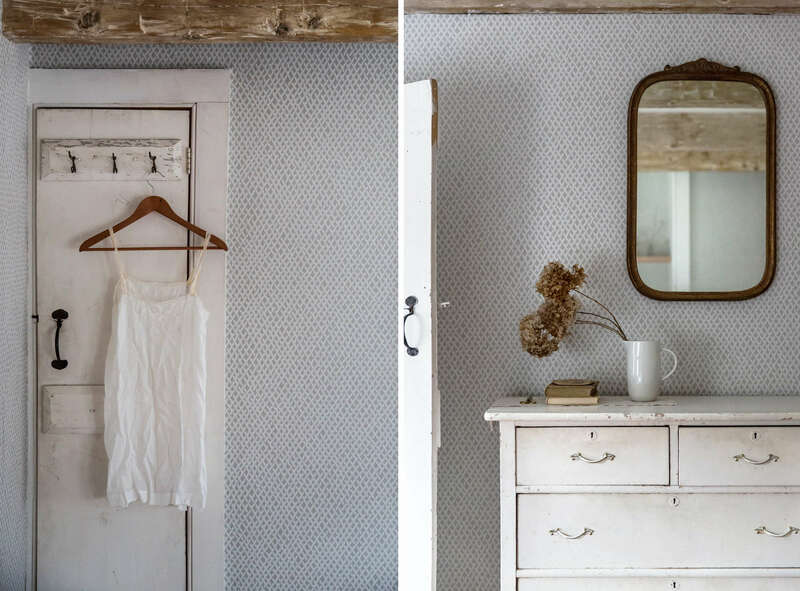 Above: Both contemporary and old fashioned, the Farrow & Ball wallpaper has a timeless look and pairs well with vintages pieces. 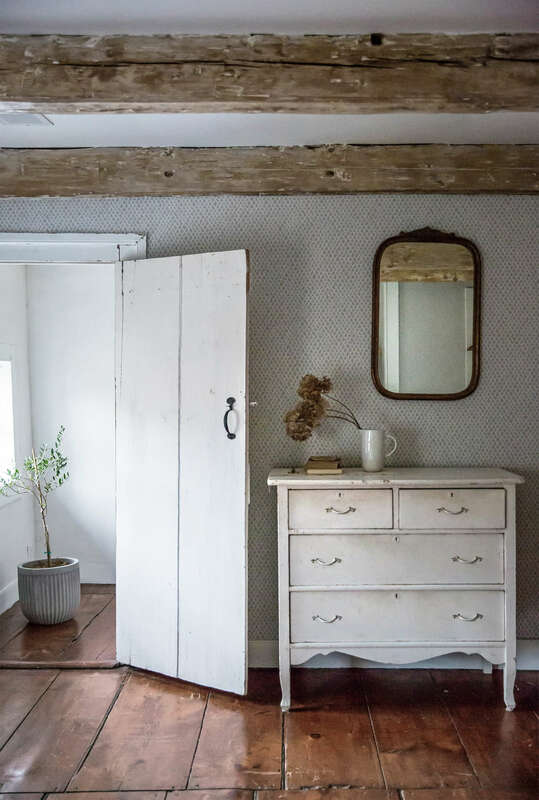 Above: Rustic meets romantic with a rough-hewn beam, crude but charming door, and Farrow & Ball wallpaper. 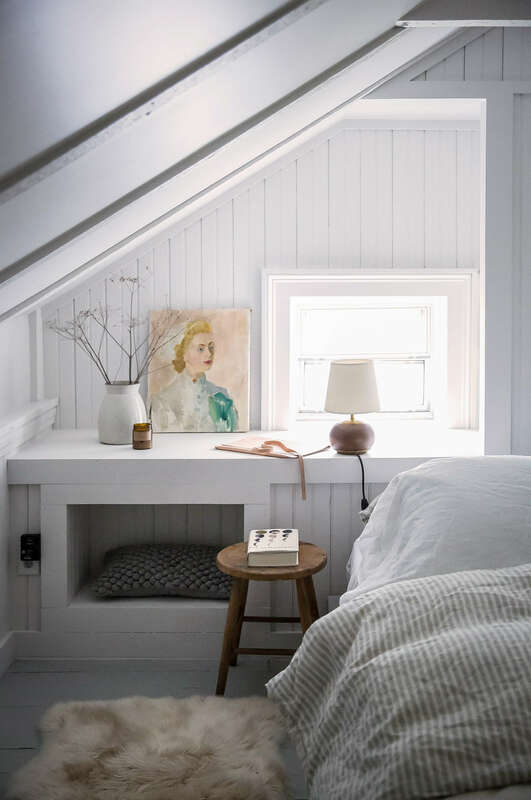 Above: Another bedroom tucked under the eaves was enlivened with a fresh coat of Painter’s White from Behr’s. 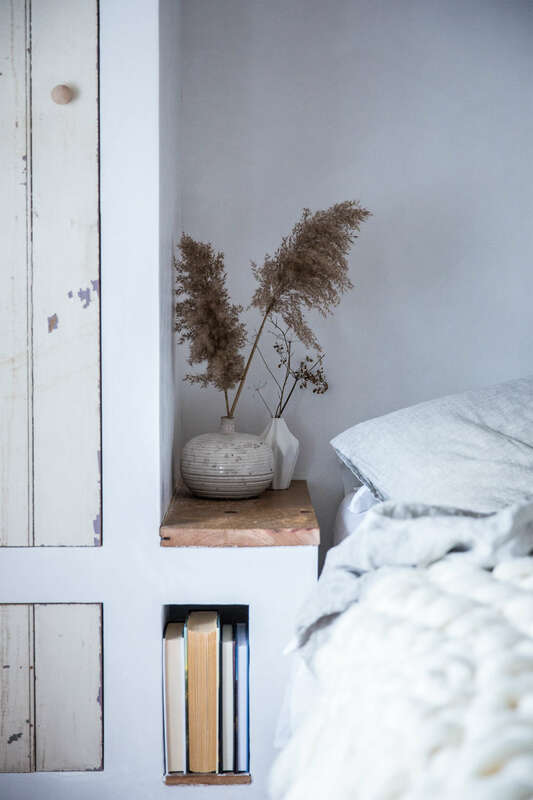 Above: A bedside shelf in the same bedroom features a mix of pots from Anthropologie and Terrain. Above: Tara and Percy left the exterior of the house as they found it.